Credible, scientific based research has been a critical tool in SEWAs advocacy efforts. Through research, SEWA strives to bring its members, the self employed women, into the mainstream of the world of knowledge. Action oriented research is the corner stone of this intervention and SEWA Academy is the organizational wing responsible for this task. The Research Programme of the Academy has the following distinctive features which sets it apart from the mainstream research bodies and think tanks and gives it the distinctive characteristic and a unique position of its own. SEWA Academy has a unique perspective  a grassroots perspective through which to view development issues. What sets research done by SEWA apart is its driving force and guiding principle  research must be used to understand the lives of its members and guide action. Research projects are directly linked to action and immediate usefulness  supporting SEWAs organizing, program development and advocacy campaigns. SEWAs research is uniquely positioned, connecting the Micro and Macro level, between grassroots women and the local development context at the micro level, and the government policies and the economic development process at the macro level. Through its research, SEWA has been able to understand the effect of macro policies on the welfare of poor women at the grassroots level; and lobby to mitigate its worst effects. Research has also documented alternative solutions at the grassroots and then lobby for these solutions to be included in macro level program. Research helps SEWA capture the condition and contribution of self employed women and speak credibly on their behalf for changes in local, national and international policy. Although they are significant contributors to the economy, few researches have been conducted regarding the status and needs of self-employed women. Because research is the "common language" within policy and international forums, this knowledge gap renders women "invisible" for all practical purposes and sustains their exploitation. By filling this gap through research and encouraging others to research the informal sector, SEWA has begun to translate its members experience into objective scientific data. These data have been used as the basis to influence policymakers and call for widespread policy change. Today, SEWA has emerged as an organization with a strong field base which is also well knit into the both national and international networks and policy dialogues concerning the informal sector, workers and women. Through research, SEWA has been able to share its experience and lessons with colleagues across the country and the world. It has helped lay the groundwork for the larger national and international movement of self-employment women by educating external audiences including international leaders and funding agencies. In SEWA Academy, research is informed by those deeply familiar with the issues and their context. Research is carried out by a team that includes grassroots researchers. 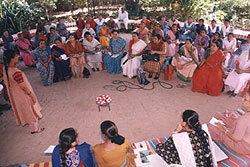 One of SEWAs most fundamental values is its commitment to training up its members. In this tradition , members have been trained to become the core their new internal research team. Today SEWA Academy has developed a grassroots research team by training members as researchers and established a decentralized research structure. Developing a team of grassroots researchers has been a milestone in the organizations evolution. Once dependent on others to capture and convey their experiences, women have learnt to tell their story themselves. Today, 50 of the 75 researchers (including grass roots) are from the working class background. The Academy has had great success retaining both working class and middle class team members. Besides, SEWA today employs a variety of research methods on a large number of topics, produced and have disseminated their finding using both the print and the video medium. Jyotsnaben Kantibhai, a tobacco plant worker and member of the Kheda research team, remarked: "My family objected to my going to the training even though I had been involved in SEWA for many years. I had never been away that long. When I came back, I told them all that I had learned and they were very impressed. But my husband said, 'Just don't do you research on me!' Now, they are supportive. My husband even helps me in coding my questionnaires when I work at night." Others report similar experiences of anxiety. Zohraben Sheikh of Ahmedabad City said, "The first day was horrible. I vowed I wasn't going back. But I forced myself. The facilitators gave me lots of help and I slowly became more comfortable. The trainers were excellent. I felt I could ask them questions easily. Even though I was still confused much of the time, on the last day everything began to make sense, to come together." Although she remains positive about experience, Zohraben has not become a researcher due to seasonal work demands and family problems. - Why research in SEWA?